A one-year-old girl who had a stroke in the womb that caused several life-threatening health conditions is experiencing small victories by talking, scooting and clapping. Naomi Kretschmer suffers from epilepsy, cerebral palsy and is partially paralyzed on the right side of her body due to a brain hemorrhage that caused permanent damage to the parts of the brain that control language and reasoning. 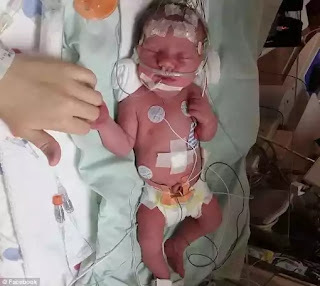 At 36 weeks pregnant, her mother Melanie, 28, had not felt Naomi kick in more than a day and went to a nearby hospital in Wisconsin where an ultrasound revealed the baby was in distress. Within an hour the now-mother-of-two was under general anesthesia for an emergency c-section to deliver the baby who was seizing and needed to be resuscitated. Nineteen months later, despite her conditions, Naomi is defying doctors expectations by reaching 'inchstones', as her mother put it to Daily Mail Online, such as speaking, scooting down stairs and even crawling on occasion. Fetal strokes occur in one in every 2,800 births, and babies who survive have a 60 percent risk of permanent brain damage. Strokes either before birth or within days after birth are the most common causes of paralysis and cerebral palsy in children. In May 2016, at four days old doctors confirmed Naomi had a stroke in the left side of her brain in utero, causing paralysis on the right side of her body. Melanie and her husband Joe, 38, a National Guard recruiter and veteran, were left wondering if their daughter would ever walk, talk or live an average life. 'I asked all of those questions but nobody was able to give those answers,' Melanie, who formerly worked in pediatric medical support but now cares for Naomi full-time, said. Melanie was having a normal pregnancy with Naomi except that she rarely felt the baby kick. 'I only had a very active little boy to compare her to so I was concerned,' Melanie said of her eight-year-old son Dominic. Doctors assured the parents it was normal and suggested tracking the kicks by doing regimes to induce movement. For two weeks Melanie would drink orange juice to raise the baby's blood sugar and get her active before laying down to feel for a kick - which usually came within 20 minutes. However, one night she and Joe could not feel a kick for hours. 'It was a mother's instinct and I couldn't shake the feeling something wasn't right,' she said. Right before midnight Melanie went to Marshfield Medical Center where nurses hooked her up to monitors and conducted a fetal stress test. Naomi was moving but she wasn't 'liking' it, doctors told her mother. The baby was in distress but it was unclear why. 'They just told me she needed to be born and born urgently,' Melanie said. She was placed under general anesthesia and delivered their baby girl. When the new mother woke up in her hospital room, she had no idea that her baby had seizures for eight minutes after birth and was in the Neonatal Intensive Care Unit fighting for her life. 'It was about four or five hours later when doctors came in and told me that she had not been breathing and they had to resuscitate her,' she recalled. The couple said the news was 'mind-blowing'. They recall being fearful after the diagnosis because they thought their new baby was so fragile and they had never dealt with the cocktail of medications they would have to give. Doctors are still unclear about how Naomi will develop but neurologists said she will likely never outgrow seizures. 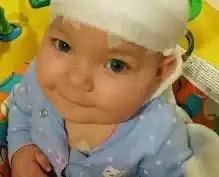 At two months old Naomi was having seizures three to four times a day. Now at 19 months old she still experiences several seizures a month. She began occupational therapy at two months followed by physical and speech therapies. Naomi wears leg braces to stabilize her due to her cerebral palsy that affects her muscle movement and coordination. She says several words including 'mama' and 'dada' which her parents call 'inchstones' instead of milestones. 'She is sitting up by herself, scoots all around the house and goes down the stairs and recently started clapping,' Melanie said. Melanie added that her daughter brings her right hand to meet her left when clapping - a big victory that shows she is gaining movement in her right side. 'She just has to work harder and think harder to move,' she said. The diagnosis has been 'a life changer' for the family, Melanie explained. Along with taking care of her daughter full-time, she has started a non-profit organization to raise money for families with children who have disabilities. She said the insurance the family has covers all of Naomi's medical costs, but knows that other families are not as lucky. That inspired her to start Naomi's Need for Peds last year which has hosted 5k runs, silent auctions, dinners and raffles to provide assistive medical devices for families whose insurance doesn't cover them.